I’m going to be honest. If you want shoestring potato fries cooked to crunchy perfection, you’re gonna have to fry ’em. Some things you just can’t work around. They must be fried! The trick? 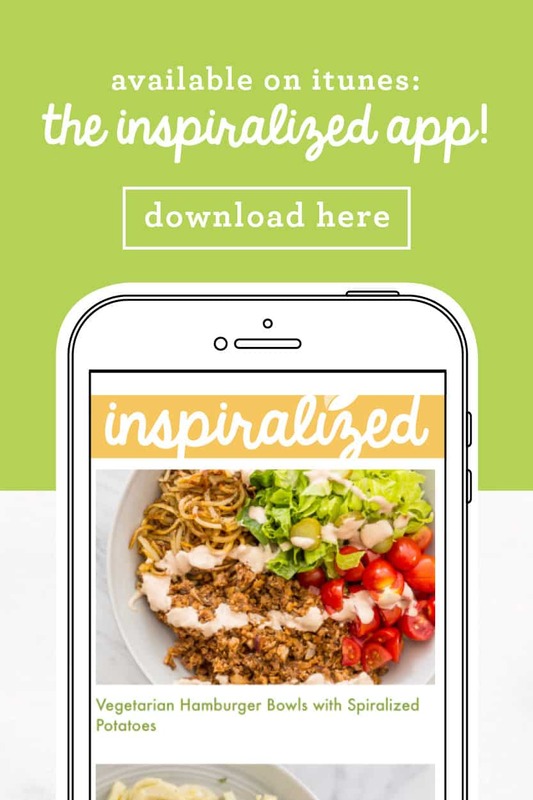 Use the Inspiralizer. No, really. 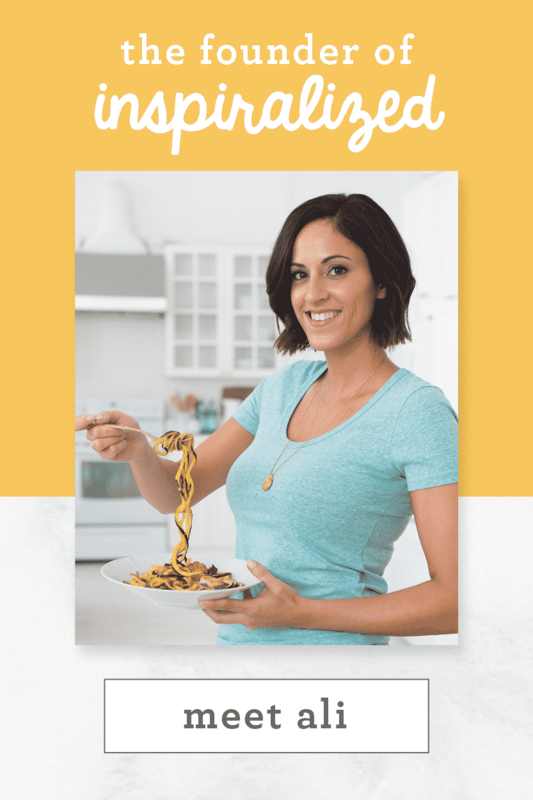 Blade D yields a noodle that’s between a spaghetti and an angel hair and it’s the ideal size for making shoe string fries! The other trick? 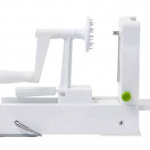 After 10 minutes, you amp the heat up to 425 degrees and after 3-5 minutes, start watching your noodles every minute. If pieces begin to burn, give them a light toss. If they do burn, that’s okay – you can always clip them off before you serve or enjoy yourself. Honestly, the last 5 minutes of the cooking process are crucial. As long as you commit to opening the oven and checking them out, you’re good. I suggest using mini pasta tongs or even just a fork to move them around so they don’t burn. As long as you do that, you’ll get as perfect-as-possible shoestring potato fries. Another trick? Let them cool off a bit. When they cool, they crisp up a little bit. Not much, but a little bit. In the end, if they aren’t as crispy as you like, just switch your gameplan and instead of eating them like fries, top them on a burger or a salad as a healthy superfood garnish! 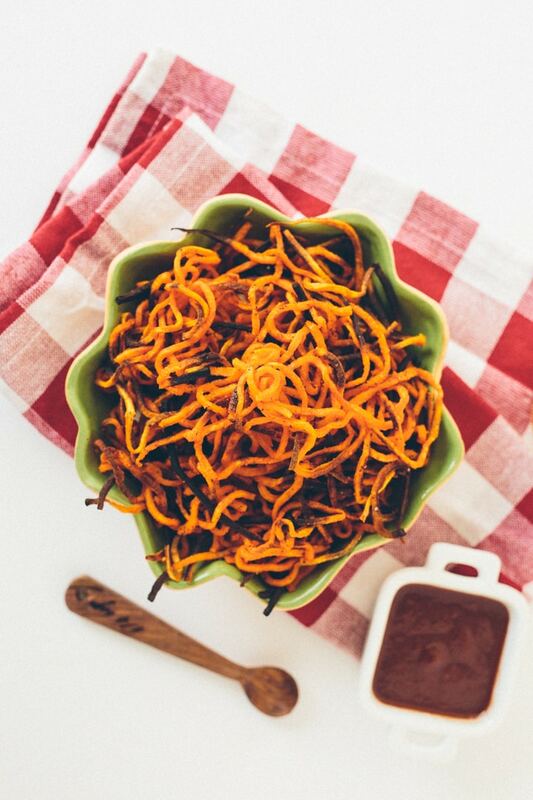 Have you tried making sweet potato shoestring fries? What have your results been like? 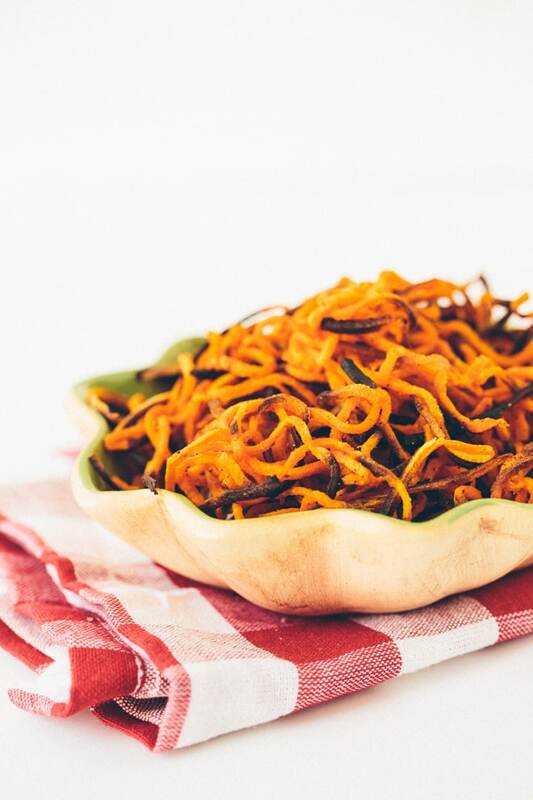 Spiralized Garlic-Paprika Sweet Potato "Fries"
Preheat the oven to 400 degrees. 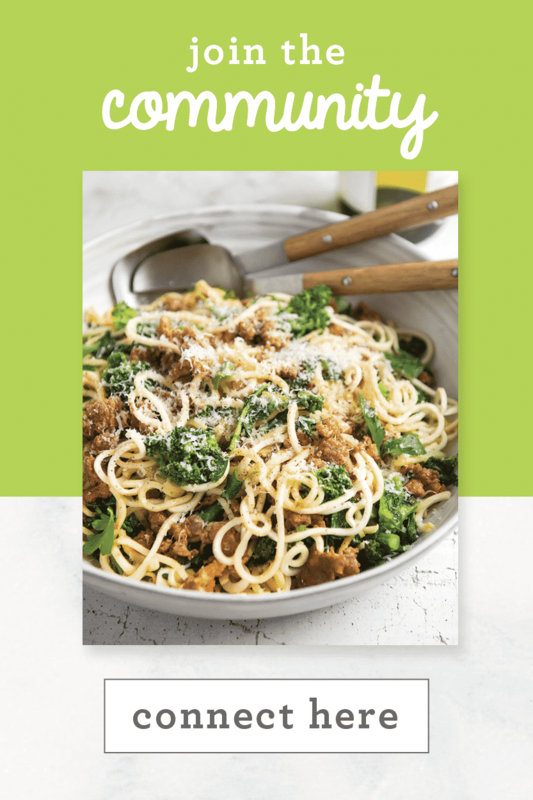 Spread the noodles out on a large baking tray and drizzle with the olive oil. Toss the noodles together gently with your fingers, coating the noodles in the oil. Season with salt, paprika and garlic powder. After 15 minutes, make sure to check the noodles to prevent burning. If starting to burn, toss those pieces gently. Serve, discarding any completely burnt pieces, with favorite dip or ketchup. Hi Erin! I'm loving your recipes. 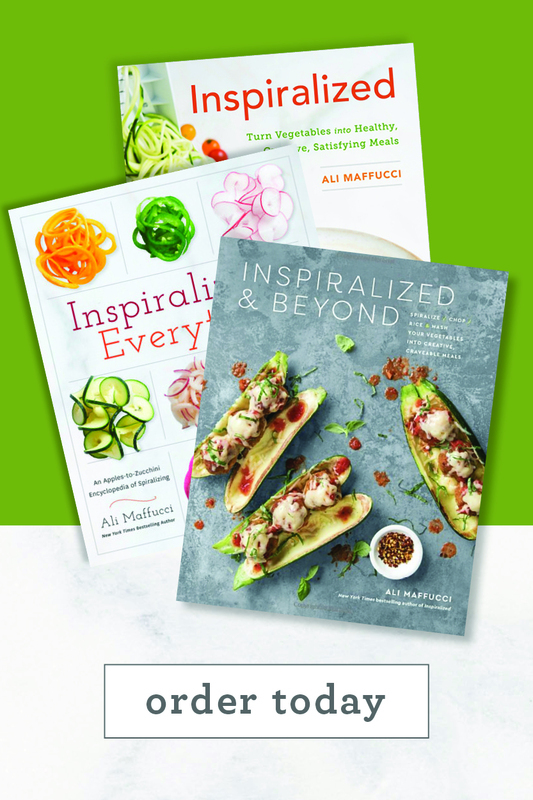 They are "inspiring" me to try to make many dishes that I might never have tried. Only a little glitch with your sweet potato fries recipe. You forgot the instruction to "ramp up" the heat to 425 after 10 minutes. I've made these before and love the difference in textures between the not-so-cooked sweet potato and the very-cooked sweet potato. Thanks for all the great recipes! Yikes! I was looking at Erin's comment and accidentally wrote her name! Please fill in Ali for me. Mea culpa. 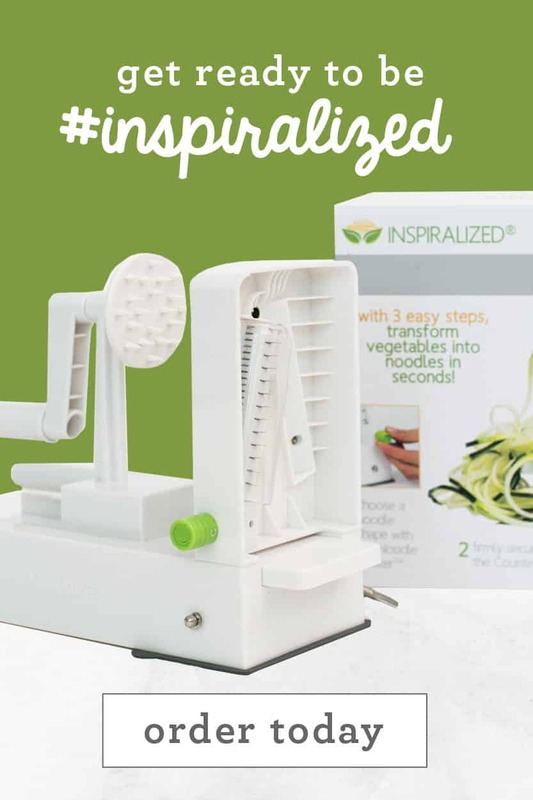 This spiralizing cooking method works really well for celery root too! Trying these tomorrow ... With... Any more ideas? What can I serve them with? Nancy, I like mine with a sprinkle of brown sugar and dipped in whole grain mustard. A turkey burger? Or black bean burger? 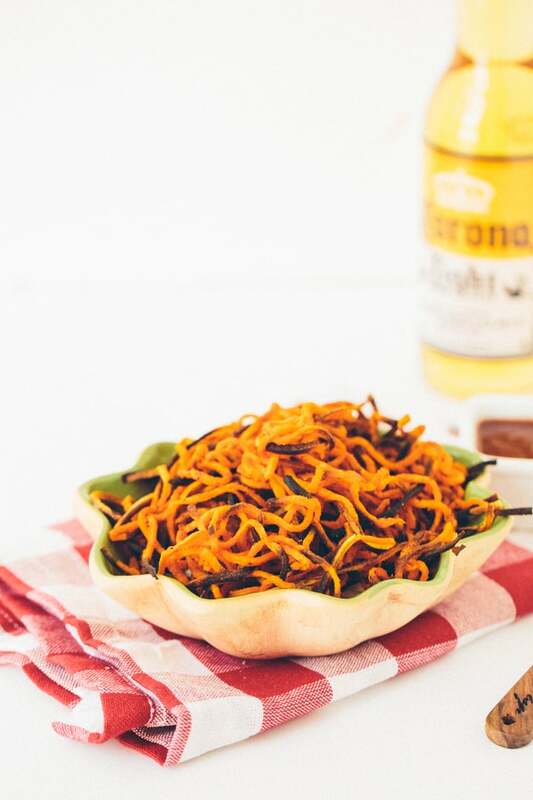 You could even use the spiralized bun! 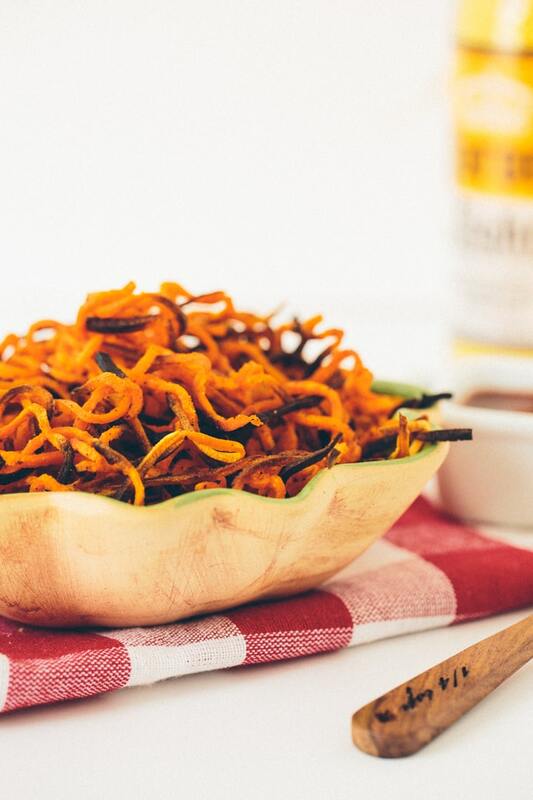 Sweet potato fries go with so many things! I love them with a BBQ chicken or chickpeas! They're great alongside a burger, or with fried eggs and avocado as a breakfast for dinner situation ! Made these tonite for the grandkids. Also put on some Parmesan cheese. Then cooked in the airfryer. A little too salty, but otherwise came out very well. Total of ten minutes cooking time. What letter did you use? D or? Made these tonight. So yummy! Thanks for the D blade recommendation. Took my weekly sweet potato fry night from good to awesome! Looks delicious and healthy as well...will try it for sure. Looks delicious & healthy as well...will try it for sure. Thanks for sharing. 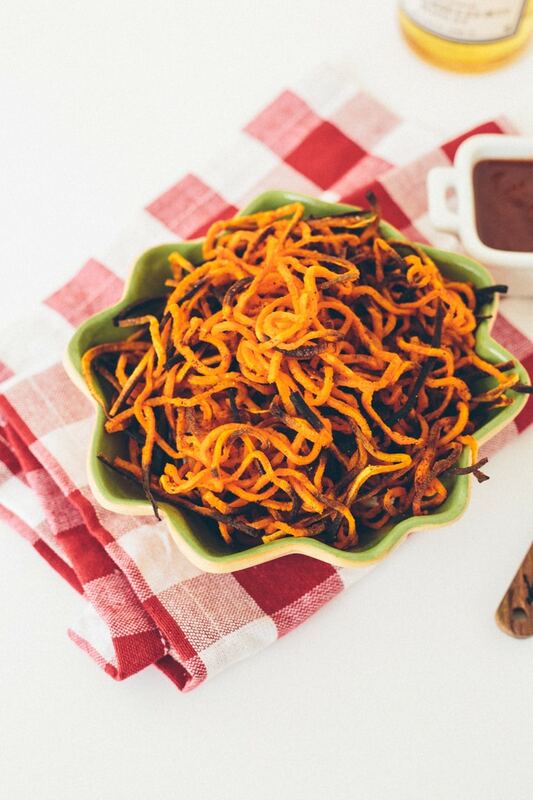 These sweet potato fries look incredible and I am so obsessed with their pigmented colour. I have to try out the recipe! I'm making these again tonight - so much better than the last recipe I tried. I love that there's more cooking area when they're inspiralized - and the spice mixture kicked them up a notch! Thanks! With my standard wavy edge sweet potato fries I get best results using parchment as the pan liner. Anyone ever compare foil, parchment, silpat, or just baking pan? What were the results? I'm looking forward to spiralized SPF's! I dust the sweet potato fries with cornstarch then drizzle with olive oil. The corn starch makes them super crispy. Wow, Amanda! I never heard of dusting with cornstarch. I'm going to try that! 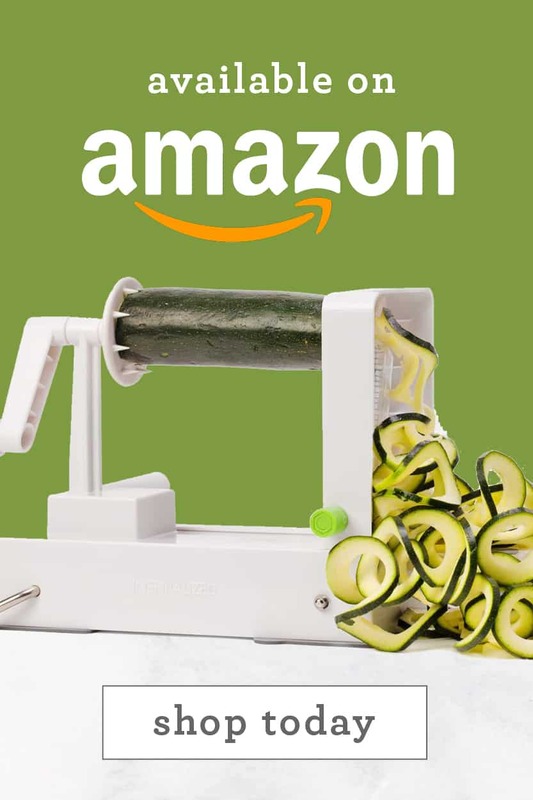 I like spiralizing multiple root vegetables and mixing them all together. I have done sweet potatoes, white potatoes, celery root, carrots, parsnips, What amazing taste sensations! And I love topping them all with smoked paprika! I usually eat sweet potatoes with cinnamon. where can I substitute this is the recipe? Hey there I am so delighted I found your blog, I really found you by accident, while I was looking on Digg for something else, Anyhow I am here now and would just like to say cheers for a incredible post and a all round thrilling blog (I also love the theme/design), I don't have time to browse it all at the moment but I have bookmarked it and also added your RSS feeds, so when I have time I will be back to read a great deal more, Please do keep up the excellent job. help! I used blade D and I got discs or chips?? Hi Susan! Please email me - [email protected] - I'd be happy to help you troubleshoot! Hi Susan! 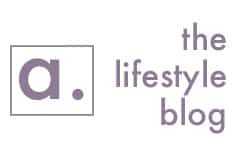 Thank you for reaching out. Please send an email to me - [email protected] - I can help you troubleshoot. This was dreadful, not at all as described, no crisp nor crunch, just limp 65% burnt noodles after 10 mins.